Installing a well-designed and aesthetically pleasing kitchen is paramount to creating an enjoyable, inviting property. Considered to be the centrepiece of the modern home, today’s kitchens are constantly on show and worthy of careful design attention. Discover how to incorporate the latest kitchen trends (and simultaneously ditch the dated styles) with these top tips. The glossy kitchen of decades past will be replaced with the more natural look of matt finishes, particularly on benchtops. All-black kitchens, in particular, lend themselves well to the use of matt finishes. 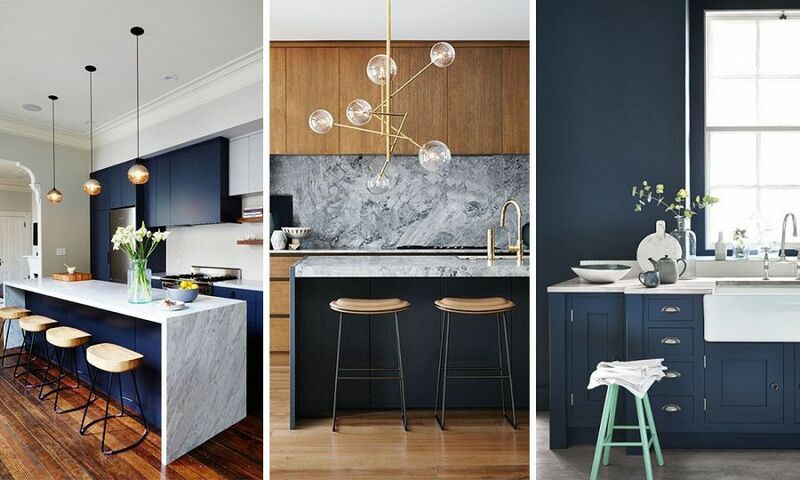 Try using Laminex Impressions in Black Nuance finish on kitchen cupboards, or Impressions in Black Spark finish on benchtops, for a modern, high-quality look. While marble remains a popular material among many renovators and home owners, it is not overly practical when used in busy kitchens. In reality, marble requires regular maintenance and care to keep it looking beautiful. An engineered stone product allows consumers the look of marble in their homes, without the impractical downsides. “Essastone by Laminex is engineered to guard against staining, scratching and citrus acid marks, making it quick and easy to clean,” Valente says. Try essastone in Fino Venato for a soft marble look that features distinct brown-grey veining on a crisp white background. “We also have strong finishes in both our Laminate range, with 180fx Carrara Marble and Carrara Bianco,” Valente says. Forget stark whites, grey is being hailed as the staple colour for modern kitchens. Shades of grey can be incorporated into kitchens in a number of ways, such as through the use of concrete floors or as a feature paint colour. While grey is a slightly more daring departure to the standard white, it is still a neutral colour that can easily be layered with other products and styles. Try using grey for the “fixed” elements of a kitchen, such as benchtops or splashbacks, and pairing with other colours and styles to suit current trends. After years of minimal kitchens dominating the market, experts are predicting character-filled kitchens will make a comeback. Try adding personality to your home with the more easily replaceable elements, such as tableware and appliances. Installing open-shelving to display ceramics, vases and colourful appliances is an easy method for adding texture and interest to a kitchen. “We are seeing lots of coloured appliances in the overseas market, particularly the US,” says Mal Corboy, Schweigen ambassador and award-winning kitchen designer. Adding metallic and timber accents is another way to create a valuable point of difference. Materials in these shades can be applied to cabinetry, panelling and kickboards, as well as doors and tapware. “The Laminex Innovations Range has the stunning inclusions of soft gold by the way of Brushed Titanium,” Valente says. The rise of custom-made furniture and personalised appliances are taking the concept of “kitchen personality” to the next level. Corboy advises home owners not to focus on recreating the previously popular triangle kitchen layout in their homes, but to create a design that works best for their lifestyle. “Don’t get too hung up on the refrigerator, sink and stove design triangle. This layout is now outdated thinking and we tend to design more in zones, for example, cleaning, food prep and storage zones,” he says. If you’re a regular cook, invest in quality appliances to make this everyday experience more enjoyable and relaxed. “As a designer, we are talking to our clients a lot more about how they use all their appliances to meet their home life and cultural needs,” Corboy says.